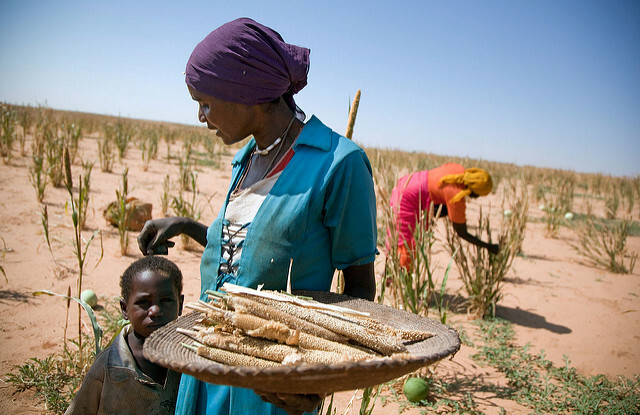 Livelihoods in West Africa are at risk to the climatic variability presented in the region. 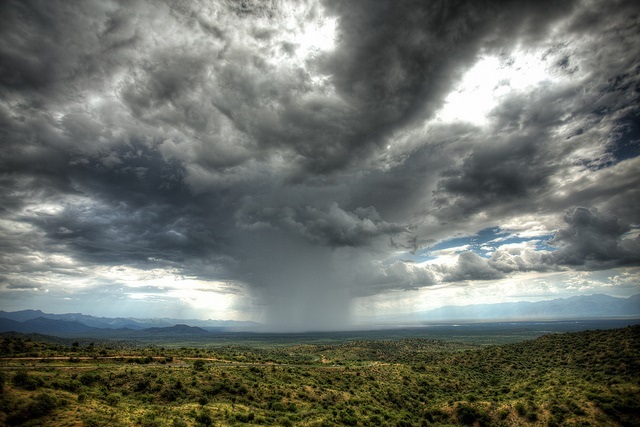 West Africa, in recent decades, has experienced extreme rainfall variability. In the 1970s and 1980s, the climate variability in the West Africa region contributed to a pervasive and protracted drought that resulted in a famine. In subsequent years, there was an increase in seasonal rainfall in the Sahel that contributed to floods that further devastated the region. The physical causes of historical climate variability are well understood, however, understanding future climate variability is hampered by an uncertainty of future greenhouse gas emissions, land cover change and aerosols affecting future climate variability and rainfall. This uncertainty, coupled with the weak capability to plan investments on decadal timescales, results in the limited climate change knowledge being used as a guide in development decision-making. 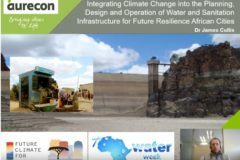 The African Monsoon Multidisciplinary Analysis (AMMA) 2050 team aim to increase the understanding of the regional climate and how it will change, applying this knowledge to practical development questions. AMMA-2050 aim to address the challenges of understanding how the monsoon will change in future decades, to 2050, and how this information can be most effectively used to support climate-compatible development in the region. By applying expert judgement, AMMA-2050 will identify adaptation options in water resources and agriculture. AMMA-2050 will improve understanding of how the West African monsoon will be affected by climate change in the coming decades – and help West African societies prepare and adapt. 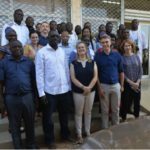 AMMA-2050 are conducting pilot studies that are focused on the issues of urban flooding in Ouagadougou (Burkina Faso) and climate-smart agriculture in Senegal. In Senegal, AMMA-2050 will provide women and marginalised groups with information regarding future crop yields, water availability and suitable adaptation options. Senegal is developing national adaptation plans, agricultural plans and determining sectoral National Determined Contributions (NDCs). These present opportunities for AMMA-2050 to engage with national and regional decision-makers. AMMA-2050 is preparing for a forum with national and regional decision-makers in Dakar to inform these plans and NDCs. In Ouagadougou, Burkina Faso, AMMA-2050 is supporting flood-resilient planning using new hydrological mapping models and associated future scenarios. To develop this mapping AMMA-2050 engaged with a group in Montpellier France (IRD who lead the Raincell project in Ouaga) and established a working remote connection to the Athys model developed by IRD. ATHYS (A Telier Hydrologique Spatialisé) is rainfall-runoff transformation model, developed by the Research Institute for Development (IRD) of Montpellier. The basic principles of ATHYS are a hydrological environment for distributed modelling, including a series of models, DEM processing, hydrological and rainfall data and geographical display, spatial data interpolation. AMMA-2050 research focusing on the wider West Africa region will identify regions at particular risk of flooding now and in the future, to support planning and infrastructure. With climate variability and change one of the complex mix of factors contributing to increased urbanisation, migrant communities moving into Ouagadougou are also more likely to live in flood-prone areas. 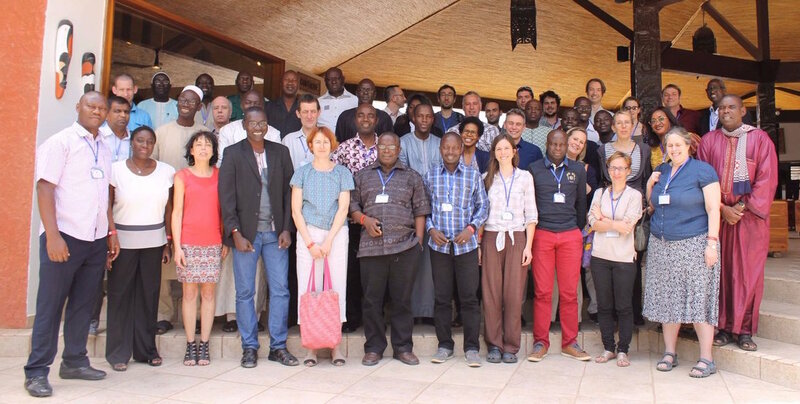 The collaborative work between scientists and policymakers in West Africa and Europe aims to increase the understanding of the regional climate and how it will change, applying this knowledge to development questions in the West African region. The research is supported by traditional climate change computer models with observations and cutting-edge regional climate models. 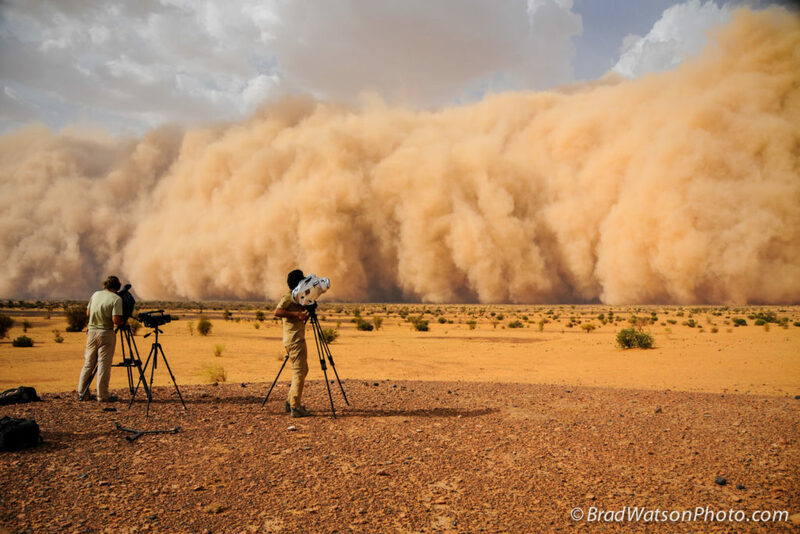 With an advanced method, these are used to assess how the West African climate is likely to change in future decades and understand weather events that significantly impact livelihoods. Applying expert judgement to these outputs, AMMA 2050 will identify impacts and adaptation options in water resources and agriculture, including targeted studies on urban flooding and crop breeding. 1. provide expert judgement on future projections of High Impact Weather and climate which is tailored specifically to the needs of decision-makers. 2. create tools and methodologies for using these projections for planning within the agricultural and hydrological sectors. 3. demonstrate the potential for effective application of reliable 5-40 year climate projections and associated uncertainties in regional to local scale decision-making. AMMA 2050 will translate regional climate projections, accounting for physical uncertainty and socio-economic context, into regional projections for water resources and agriculture, including pilot studies on urban flooding and resilient agriculture. Decision makers will be integrated from the outset, using an ‘assess-risk-of-policy’ framing whereby decision makers will have an essential role in framing uncertainty descriptions – assisting users to take ownership of the research and simultaneously building capacity. Tanya is an experienced project manager with a background in eco-hydrology. She manages several large multi-sectoral international projects, coordinating numerous and diverse project partners (Europe, Latin America, Africa). Her role includes disseminating project outputs to the wider public, including private sector and policy makers. Previously she held a Knowledge Exchange fellowship with NERC on climate change and water scarcity. Tanya holds a PhD in Civil Engineering from the University of Minnesota-Twin Cities and an Msc, in Esturarine and Coastal Science Management from the University of Hull. Francois is an agronomist and an Agricultural Research for Development (CIRAD) researcher. He holds a Ph.D. in Agronomy and Crop Science from Agro Paris Tech, Paris, France. His personal interests include rock climbing and skiing. Camilla is a postdoctoral researcher with a passion for investigating wicked problems and my work focuses on natural resources and especially land management, climate change resilience, indigenous knowledge systems and disaster risk reduction/management in Sub Saharan Africa. Camilla is interested in interdisciplinary research, interactive teaching techniques and active learning for different disciplines. She is always looking for new academic adventures, consultancy opportunities and publications. Camilla is currently based at King’s College London, with teaching responsibilities at University of Northampton and research collaborations with University of Sussex. Adama did his Ph.D. in meteorology and climate science at the Federal University of Technology Akure (FUTA) in Nigeria. Since January 2016 he has been recruited as an assistant lecturer and researcher at the laboratory of atmospheric physics and fluid mechanics of physic department of University Felix Houphouet Boigny (UFHB), Abidjan, Cote d’Ivoire. Adama is working as a researcher on the AMMA-2050 project on behalf of UFHB and research board member of African Excellence Center on Climate Change, Biodiversity and Sustainable Agriculture. He also does some consultancy in the climate change domain. The main focus of Adeline’s research is to understand how biodiversity of tropical plants is shaped through evolutionary forces resulting from human and environmental impacts. The main activity of her research group at the Research Institute for Development (IRD) focuses on population genetics but also integrates a multidisciplinary approach including ecology, botany, molecular phylogenetics and anthropology working in Senegal, Cameroon, Niger, and Peru. Victoria leads the Hydrological Modelling and Risk (HMR) Group at the Centre for Ecology & Hydrology in Wallingford. Her current research interests include the development of a grid-based, integrated model to estimate large scale pools and fluxes of nutrients across the UK, national-scale drought modelling, development of hydrological methodology and models for national scale (Great Britain), analysis of flood risk to infrastructure systems and a UK-wide seasonal hydrological forecast system. Lecturer and Researcher in Water management and sanitation in rural and urban areas. Andy is Professor of Climate Impacts at the University of Leeds. He began his career with a Ph.D. at the University of Leeds on boundary layer flow through forests, moving to postdoctoral research on the impacts of climate variability and change on food crops at Reading. Andy led the NERC consortium End-to-end quantification of uncertainty for impacts prediction (EQUIP) and leads work on Climate Smart Agriculture for Climate Change, Agriculture and Food Security (CCAFS). He was Lead Author on the ‘Food Production Systems and Food Security’ chapter of the Fifth Assessment report of the IPCC. Moussa is a postdoctoral researcher at the Cheikh Anta Diop University of Dakar, Senegal. Moussa’s research interests are Local air-sea interaction, Ocean impacts with continental climate & Climate models bias. Moussa holds a Ph.D. in the Earth and Environmental Sciences from the Pierre and Marie Curie University, as well as a Masters degree in Meteorology, Oceanography and Arid Environments from the Ecole Supérieure Polytechnique of Dakar in Senegal. Rory is a postgraduate student at the University of Leeds. His research interest is focused on predicting the West African Monsoon. Rory holds an Msc in Atmosphere-Ocean Dynamics from the University of Leeds and his field of expertise is in climatology, climate variability, climate dynamics, climate modelling and meteorology. Gino is a research fellow in Geography at Susssex University. Gino has over 25 years experience in social and economic development. Over the past 12 years he has worked as a management consultant within the public sector and housing associations specialising in social value, employment, partnership building and community engagement and governance. Gino holds a BA Honours in Environmental Studies from Sheffield Hallam University. Prof. Amadou Gaye is a scientist and Director of the Physics Laboratory of the Atmosphere and the Ocean at UCAD and is specialised in rainfall variability related to the African monsoon. He is very much active on analysis of climate simulations for climate change and variability issues. He is involved in the coordination of African scientists working on Climate. He has been Project Investigator for several research projects. Francoise is with the Mesoscale, Meteorologie Group at the National Centre for Meteorological Research. Andy analyses the risks of climate change, in order to help people, businesses, governments, and NGOs adapt to climate change. Andy’s work aims to develop tools and methodologies for the assessment of the risks of climate change, with a focus on the multi-disciplinary nature of risk analysis. He has used his analytical skills in a variety of projects such as the risks of climate change on key species and ecosystems and the visualisation of global sea-level rise hazards. Helen leads research in water resource assessment and management within CEH, with a strong background in African research. She leads team at CEH working on developing, testing and applying the GWAVA water resource model. Her interests lie in building research capacity, and in building technical capacity in national hydrological agencies to manage water resources effectively and sustainably. Serge is currently the research director at the Institut de Recherche Pour La Developpement (IRD). He holds a Ph.D. degree and his thesis focused on Climate Variability in Africa from the Université Pierre et Marie Curie (Paris VI). His research interests are in climatology, meteorology, atmospheric sciences, atmospheric physics, hydrometeorology, climate change and African climate. Dr Ndjido Kane is a geneticist and plant molecular biologist with strong expertise in crop evolution, adaptation and mitigations to environmental stress. He is working to preserve and exploit the genetic diversity of cereals in previsions of a climate change and for growing population’s needs. Ndjido holds a Phd in Biology from the University of Quebec as well as Post-doctorate degree from the Center for Research and Technology. Harrouna is a Lecturer in Hydrology and Hydraulics Applied at the International Engineering Institute of Water and Environment (2iE). He holds a Diploma of Advanced Studies (DEA) in Hydrology, Hydrogeology and Geostatistics, and Water geochemistry from the National School of Mines in Paris (France) and a PhD in Geosciences and Natural Resources from Pierre and Marie Curie University, Paris, France. Cornelia has a background in atmospheric modelling with the Weather Research & Forecasting model (WRF). Currently she is focused on remote sensing data to analyse characteristics of high impact weather in West Africa. Cornelia is interested in how and at which scales surface characteristics may impact the West African monsoon system and the occurrence or maintenance of convective systems. Cornelia holds a Diploma degree (Dipl.-Ing.) in Environmental Engineering from TU Berlin, Germany and a Phd from the Karlsruhe Institute of Technology (KIT), Garmisch-Partenkirchen, Germany. Dr. Nana Ama Browne Klutse is a Senior Research Scientist at the Ghana Space Science and Technology Institute and Manager of the Remote Sensing and Climate Centre at the Institute. She has a Physics background and holds a Doctor of Philosophy Degree from the University of Cape Town, South Africa. Her area of specialization is climatology and her present research focuses on topics in earth observations, climate modelling and climate impact assessments on society. She has worked on both national and international projects and consultancies including the Climate and Health project in Ghana. Dominic is Professor of Climate Change and Society at the University of Sussex. His research concerns both the impact of climate change on society and how to improve the use of climate information. In particular his recent research has explored the nexus of environmental change and migration and the development of methodologies including combining agent based modelling with Q methodology to explore the intersection of the natural and social sciences. Kouadio completed his Ph.D. in Meteorology and Climate Science from the Federal University of Technology Akure (FUTA), Nigeria. He is currently at Formation Doctorale Climat, Ressources Naturelles et Innovations (FD CRNI) and the supercomputer centre, from the Université Félix Houphouët Boigny in Abidjan, Ivory Coast. He is a research board member of African Excellence Center on Climate Change, Biodiversity and Sustainable Agriculture (CEA-CCBAD). Furthermore, he is involved in the AMMA-2050 project on behalf of UFHB through work package 2. James previous area of work involved applied hydrology in the consultancy sector, utilizing hydrological and hydraulic models to determine the impacts of developments on flood risk and assessing water supply scenarios. He has also been a volunteer working in Indonesia on a community flood management project, developing the knowledge and commitment of local residents in managing their local environment and building rainfall harvesting systems. Ousmane heads the research and application groups at the National Civil Aviation and Meteorology Service (ANACIM) in Senegal. Ousmane studied meteorology engineering and physics, and then went on to get a Ph.D. from Columbia University. 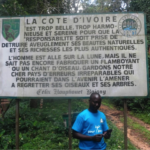 Ousmane is an expert on seasonal and monsoon forecasting and aims to foster dialogue between climate and weather experts with the hopes of enabling and encouraging farmers, herders and health workers, among others, to use climate information and related farming tips in their decision making. Dr. Siny Ndoye holds a Ph.D. in Physical Oceanography from University Cheikh Anta Diop, Dakar and University Pierre and Marie Curie, Paris. His Ph.D. research interests are the investigation of the dynamical functioning of the Senegal upwelling using satellite images, in situ data and state-of-the-art 3D numerical simulations. In Postdoctorate, he works on the project: the SCUC-2050 : Exploring the future of the Southern Canary Upwelling System funded by FCFA: Innovation Fund. His research interests include regional ocean modelling and hydrology and circulation of the southern Canary system. Kathryn is a research fellow in the Climate Impacts Group, which is part of the Institute for Climate and Atmospheric Science at Leeds University. Her work focuses on the use of seasonal and decadal forecasts in the prediction of crop yields. Kathryn holds an MSc. degree in Physics from Oxford University as well as a Ph.D. from the University of Leeds where her thesis focused on seasonal crop yield forecasting in semi-arid West Africa. Francis is a Ph.D. student with the Meteorology and Atmospheric Physics section at the Department of Physics, University of Cape Coast, Ghana. He is now working on the Evolution of Extreme Rainfall Events and its Dynamics over the Southern West Africa. He holds a BSc. and MSc. in Physics (Meteorology and Atmospheric Physics option) from the University of Cape Coast, Ghana. His research interests are primarily in regional climate change, climate modelling, climate extremes, West African monsoon and its dynamics, time series analysis and methodologies in investigating atmospheric processes. Geremy is a research scientist at Grenoble Institute of Technology. He has a BSc. degree from Avignon University, and an MSc. and Ph.D. from Grenoble University. His thesis was on Extreme Rainfall Analysis and Evolution in the West African region. His research interests focus on climatology, hydro-meteorology, hydrology, West African monsoon (especially rainfall and hydrological regimes), water cycle intensification, time-series analysis (detection/attribution), and extreme rainfall analyses (characterization, evolution, scale issues). Rameshwarah’s research interests are within river hydraulics, hydraulic and hydrological modelling, flood conveyance, turbulence measurements and modelling, flood and drought impact, fluvial ecosystems and physical habitat modelling, agro-hydrological modelling, irrigation water use efficiency, brackish water irrigation and yield response. Rameshwarah has a BSc. Honours in Civil and Structural Engineering from the University of Bradford, an MPhil from the University of Wales and a Ph.d. from the University of Aberdeen. Philippe works with LOCEAN. His research interests are climate change impacts on agriculture in West Africa, crop modelling, seasonal forecasting, and hydrology. Youssouph is a researcher with the National Agency of Civil Aviation and Meteorology (ANACIM). His research interest is in the evolution of the monsoon in West Africa. He analyses extreme weather events and their impact on the different hydrological cycles in West Africa. Benjamin Sultan is a senior researcher specialised in Climate variability; predicting Societal impacts of climate variability and crop modelling. He leads research in climate change and its impacts on agriculture in West Africa. Laure is a researcher with the Senegalese Institute for Agricultural Research (ISRA). Laure’s research interests are in soil fertility, nutrient cycling in soils, legume-based systems and intercropping and greenhouse gas (CH4 and N2O) emissions in agricultural systems. Laure holds a BSc. in Biology, and an Msc. and Ph.D. in Environmental Biology from the University of Montreal. Fowe is a researcher in hydrology and water resources. Fowe’s specific interest lies in the impact of global change on water resources in the Sahel and West African regions. Yves’ research focuses on studying how evolutionary processes shaped population and genome diversity. His research group at the Research Institute for Development (IRD) focuses primarily on cultivated crops and their wild relatives. With cultivated crops, they also seek to understand how human activities and historical events shaped their diversity. Yves holds a Master in Ecology and Evolution from University Montpellier II, France and a Ph.D. from the University of Burgundy. Theo is a lecturer in Hydrology at the University of Grenoble. Theo’s research interests centre around the long-term evolution of the hydro-climatic systems to better address drought and flood hazards. He has further skills and expertise in climatology, hydrometeorological hazards, statistical hydrology, stochastic simulations and hydrological modelling. Theo holds an MSc. degree in Mechanics, Geophysics and Environment from Joseph Fourier University and a Ph.d. in Ocean, Atmosphere and Hydrology from Grenoble Institute of Technology. Emma is a Visiting Senior Research Fellow at King’s College London in the Geography Department. She has worked with humanitarian and development operational and policy research organisations for over twenty years. She was awarded a Knowledge Exchange Fellowship with NERC to support strengthened dialogue between the providers and users of science for strengthening resilience amongst at risk groups. Emma has a BA. in Swahili and African Art and Archaeology from the School of Oriental and African Studies and an MA. in the Theory and Practice of Human Rights from the University of Essex. Catherine is a graduate environmental and civil engineer (hydrology) and has most recently consulted for UNESCO. She gained invaluable practical engineering skills whilst being involved in multiple internships and training programs. Catherine is skilled in technical writing, fieldwork, lab work, and research techniques. Motivated by work that has a positive impact on society and the environment. Catherine is currently a Ph.D. student at Grenoble University and holds an MSc. in Water and Environmental Engineering from the Masdar Institute of Science and Technology. AMMA-2050 are working on two approved Innovation projects and are currently applying for a third. 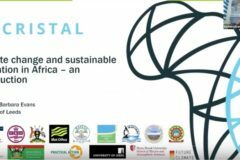 One is led by UCAD and is looking at coastal upwelling off the coast of Senegal with the inclusion of the impact this has on fisheries. 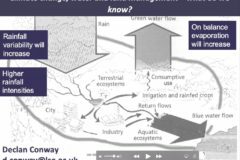 The second Innovation project is on urban drainage in Ouagadougou – this links to the work of Barbara Evans in Hycristal where AMMA-2050 are looking at sanitation flows in Ouagadougou using the same approach developed in Hycristal. The NERC Capital project, Urban Hydro-Met network 4 Africa is establishing a high-resolution Hydro-Meteorological network in three African cities located in Dakar (Senegal); Kampala (Uganda) and Ouagadougou (Burkina Faso). This information will benefit the hydrological work being assessed in AMMA-2050 to evaluate model simulations of flood-producing storms. In Senegal for the agricultural sector, AMMA-2050 are modelling impacts of climate change on different landraces. The team are collecting information on the genomes of different crop varieties (and the genetic sequencing is currently underway); this information will then be linked to climate metrics for informing which traits are most likely needed in a future climate. Participatory modelling meetings are planned for June 2018 with high-level decision makers. AMMA-2050 is also proposing to develop a MoU with the cross-party parliamentary network body, Réseau des Parlementaires pour la Protection de l’Environnement au Sénégal (REPES). In 2017, the Senegalese group commissioned a cross-sectoral review of how climate information has been integrated across public policy and the REPES Coordinator is keen to engage AMMA-2050 in informing this continuing discussion. AMMA-2050 has also benefited from alignment with a complementary initiative of LOCEAN/IRD to develop a climate adaptation portal, being piloted in Senegal, designed to support decision makers. The survey undertaken to inform the portal clarified the types of climate information required to support decision-making institutions. A range of AMMA-2050 products, including the Climate Metrics Atlas, will be shared via this portal. 2iE led Innovation Fund: Impact of Sanitation in flooding Risk in Ouagadougou. This joint pilot project involves AMMA-2050 and HyCRISTAL researchers. Using the knowledge of the current status, understanding of flood-affected areas of the city AMMA-2050 will then be able to develop the conceptual SFD model. 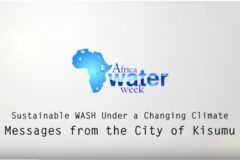 The aim of the work is to understand the impacts of climate change on urban WASH systems by combining the SFD model of HyCRISTAL with the urban modelling work being done in AMMA-2050’s pilot study in Ouagadougou. There has been an exchange of flood data and sanitation information from 2iE to Leeds, using this, a preliminary set of information slides will be prepared for the upcoming stakeholder meeting in May in Burkina Faso. This will demonstrate how AMMA-2050 are integrating climate change information and flood information on urban WASH systems. In both Senegal and Burkina Faso, AMMA-2050 are working with feedback from stakeholders that will be assessed to further support medium-term decision making.